View This: “Where Do Monsters Go When It’s Not Halloween” – Ratboy Jr.
Halloween is just around the corner! In perfect timing, Ratboy Jr. just released a video for their song “Where Do Monsters Go When It’s Not Halloween?” To help them illustrate possible fallbacks and day jobs for a variety of monsters, Ratboy Jr. gets some artistic assistance from the 1st graders at the Woodstock Day School. Through drawings, each scenario is matched up to the words of the song, i.e. mummies cleaning windows in New York City and zombies driving zambonis, for example. Even Frankenstein grabs the mic on this one. 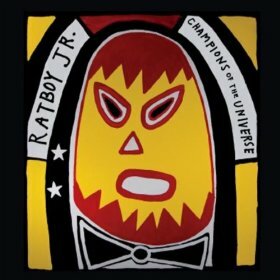 “Where Do Monsters Go When It’s Not Halloween” is from Ratboy Jr’s 2013 release, Champions of the Universe. It’s an awesome album brimming with creativity that taps into the depths of kids’ imaginations. When we first heard this song Emily, who enjoys donning a Hulk mask and shouting “HULK SMASH!,” sat straight up, eyes wide, and genuinely asked “YEAH! Where do monsters go when it’s not Halloween?” This priceless sense of wonder and curiosity is why Ratboy Jr. makes listening to music fun. When you think about it, it’s a great question, right? Halloween is almost here! Whether you are in the process of making your own costume or carving the baddest jack-o-lantern on the block, a Halloween soundtrack is a must! Below is a spooktacular playlist featuring a brilliant mix of artists! And don’t miss two great videos from The Pop Ups and Trout Fishing in America to go along with it. Get on board, step inside, soarin’ on a magic ride. Roarin’ towards the other side where only rainbows hide. The lines above are part of the theme song from one of my favorite childhood TV shows, The Great Space Coaster. Each episode took place on an inhabited asteroid (Coasterville) and followed the story of 3 musicians who were brought there by a space coaster. Along the way, they met new friends in the form of zany puppet characters. I think I might be part of a small population who remembers this show, but it was a classic. It was adventurous and totally off-the-wall funny for its time! This brings me to the latest pairing of kindie rockstars whose debut project brings me the same kind of joy. 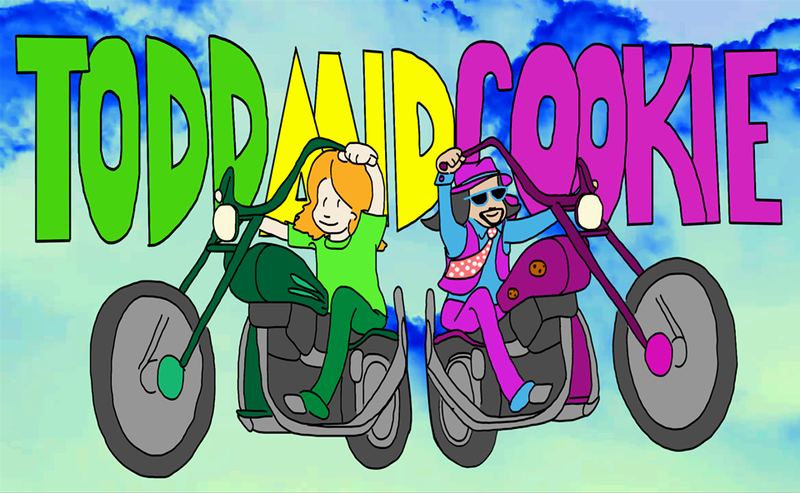 Todd McHatton and Mista Cookie Jar (CJ Pizarro), or simply put, Todd and Cookie, recently debuted their first mini album, Todd and Cookie’s Epic 3 Song Starter Pack, along with a world premiere of their cartoon, The Great Adventures of Todd and Cookie. Episode 1, called “World of Rock,” illustrates how the two rockstars are catapulted to destiny when a mysterious creature asks, “Anybody wanna rock?” You’ll have to watch to see how this story unfolds. It’s a truly visionary experience that promises to take you on a magical, mystical adventure unlike anything the kindie world has ever seen! The pairing of Todd and Cookie is not something people might have predicted or expected, but together they complement each other very well. In fact, the parallels between the two, is what I am most impressed by. Their sound is overflowing with authenticity, creativity and a unique sense of humor. They regularly stretch the boundaries of their imaginations, creating compelling experiences for their audience. And they also incorporate family as an essential part in each of their respective careers. McHatton is a puppeteer and an artist whose cartoon drawings can be seen on his album covers and throughout his videos. He is well-known for his wildly popular single “I Think I’m A Bunny,” featuring daughter Hazel and lovable purple puppet, Marvy Monstone. Each track on Todd and Cookie’s Epic 3 Song Starter Pack delivers a concoction of sounds that blend the softness of Todd’s dreamy, psychedelic sound with Cookie’s groovy, hip hop sensibilities. My favorite tune, “All These Magical Things,” has a nice melodic flow while “HotchToozZee” is a hodgepodge of fun. The album ends with “Your My Bestest Bro” which is an ode to Todd and Cookie’s relationship and could easily be the theme song for The Great Adventures of Todd and Cookie. So sit back, relax, and enjoy the ride! The duo will be releasing web comics & cartoons every 3 months chronicling Todd and Cookie as they explore the catapult of destiny! You can receive updates by following their site as well as their YouTube channel. Listen to and purchase the tunes from Todd and Cookie’s Epic 3 Song Starter Pack through the Bandcamp widget below. Recommended for ages 4 -8. Lucky Diaz and the Family Jam Band are having a wonderful year! 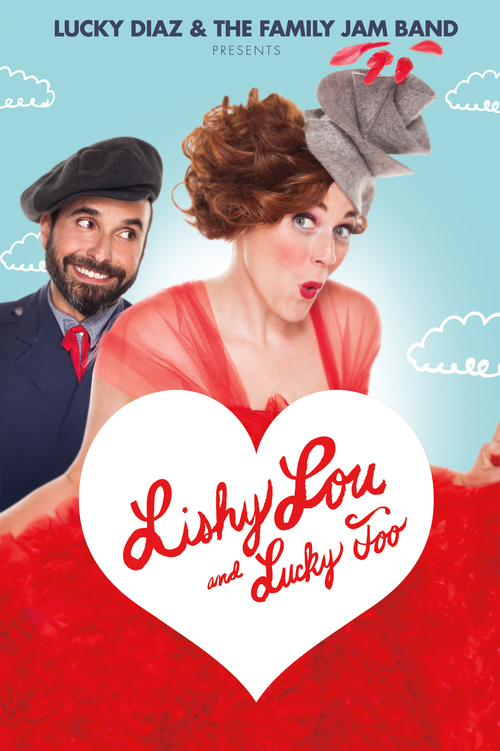 ¡Fantastico!, their first Spanish-language album was just nominated for a Grammy and they are about to release (October 1) their next album Lishy Lou and Lucky Too which is the companion for a TV show. As you can see from the intro, the show is filled with vibrant color and character (and colorful characters!). Looking at this video, and really any pictorial representation of Lucky Diaz and Alisha Gaddis, the notion that what you wear reflects your personality comes to mind. Although, I would say they radiate a whole spectrum of colors, much like a rainbow. Their spectacular display is visible in their music, stage presence and on-screen. If you didn’t catch the video for the first single, “Thingamajig” from the upcoming album Lishy Lou and Lucky Too, make sure to check it out. It’s a hoot! A perfect video to head into the weekend! “Bigga Bagga”, a song off of Key Wilde & Mr Clarke‘s album Pleased to Meet You (currently on the Grammy ballot! ), gets video treatment. The video features a montage of curious illustrations, penned by Wilde, while the song challenges to make your tongue numb. It’s good fun and I dare you to sing along! Also, check out their Ipad app by Mibblio which features their song “Animal Alphabet” and lots of irresistible illustrations. Animal Alphabet from Mibblio on Vimeo. Prior to my passion for writing about kids music, I owned a pet sitting business. It was one of my favorite jobs. My days were filled with fresh air, colorful adventures and unconditional love. Due to family obligations, I was sad when it was time to say goodbye to my furry friends and move from the East Coast to the West Coast. Earlier this year, I was lucky enough to attend Kindiefest, an annual family music conference (that I would later come to find out was in its last year). The two day conference was made up of panels hosted by experts in the Kindie community. In between panels, I found myself talking to Seth Goldstein, the producer of The Ohmies, an interactive performance group (and musical health and wellness brand) for preschoolers. As we moved along in the conversation it came up that Seth and his sweet dog, Addie, were former clients of mine! Shortly after our discussion, I got to see The Ohmies perform live during the Kindiefest musical showcase. Between the familiarity with Seth and the adorable cast of characters that make up The Ohmies, it was nostalgically delightful. So what are The Ohmies like? I will admit I was skeptical at first. I am a huge fan of Yo Gabba Gabba, however I tend to be somewhat skeptical when it comes to brands that are overly zany and bordering on gimmicky. The Ohmies could have fallen into that category but as soon as the performance started my skepticism turned to optimism. 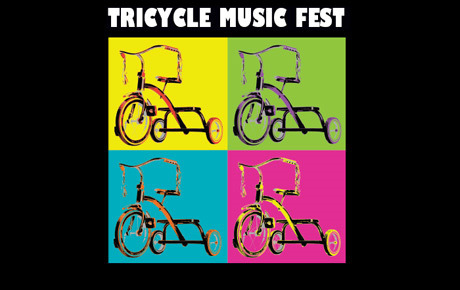 This is a talented group of performers with catchy music and sincere intentions for young audiences. I was truly intrigued and completely tuned in as they brightened up the floor with their sunny dispositions and brightly colored costumes. In no time, they reeled the crowd into their performance by guiding us through movements (some of which are based on yoga poses) as part of their songs. The Ohmies definitely have a natural ability to engage a crowd. The Ohmies are also offering a discounted digital download of their album, Morning Wish Garden (produced by Grammy nominated producer, Tor Hyams) which contains original songs from their shows. The discount is only available through September 24, 2013. Disclosure: As mentioned above, I do know Seth’s dog and by default, Seth, however this post contains my honest opinion based on personal experience during Kindiefest. Below is a brief description of what you can expect from their shows which mentions themes that translate into their music. I also encourage you to take a stroll through their site, view some videos and learn more about this group. I have no doubt that your preschooler will want more of The Ohmies. The Ohmies bring an interactive, musical adventure series to preschoolers that focuses on movement (and physical activity) as a basis for a healthy lifestyle. The storylines follow two main characters, Bailey Butterfly and her little brother Carlin Caterpillar, as they embark on adventures throughout their homeland, Ohmland (rhyme slightly intended). As Bailey and Carlin encounter new Ohmland friends, the show(s) erupt with themes related to social and emotional learning (identifying feelings, making friends, resolving conflicts, getting along with others and dealing with anxiety).